Creative Diagnostics now offers antibodies against full length or partial proteins, from the ubiquitin proteasome (UPS) pathway; these include E2 conjugating enzymes, E3 ligases, DUBs, ubiquitin binding proteins substrates and conjugate antibodies and also a number of kinase antibodies. Most of these antibodies can be used in WB and IP and can be supplied as high quality research tools to the life science research community. Ubiquitin is a small protein that is found in almost all cellular tissues in humans and other eukaryotic organisms, which helps to regulate the processes of other proteins in the body and can be found tagged to almost any protein. It is evolutionarily advantageous for all cells of eukaryotic organisms to use the process of ubiquitylation because it removes breaking, worn or sub-functional proteins from cells before the proteins cease functioning entirely. A system that pre-emptively removes proteins from use and tags them for protein recycling keeps cells healthy. Ubiquitination, also known as ubiquitylation, is an enzymatic process that involves the bonding of an ubiquitin protein to a substrate protein. This has sometimes been referred to as the molecular “kiss of death” for a protein, as the substrate usually becomes inactivated and is tagged for degradation by the proteasome through the attachment of the ubiquitin molecule. 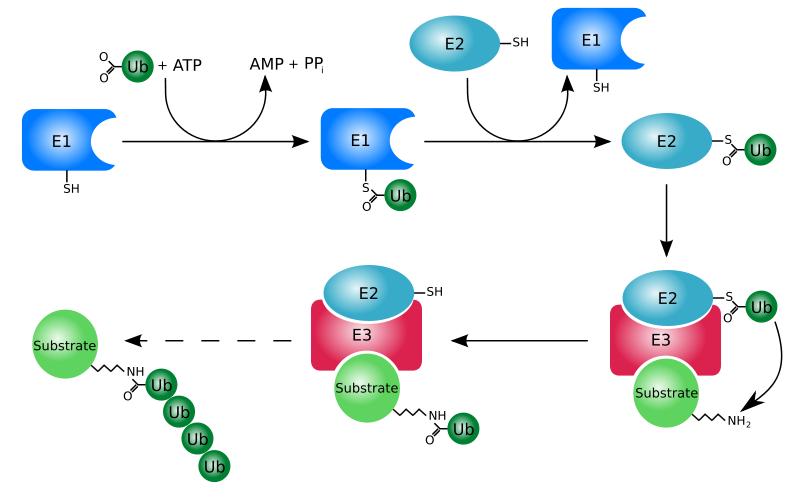 Ubiquitination occurs when an ubiquitin molecule bonds to a substrate protein and is a type of post-translational modification. The first step involves the activation of ubiquitin by the E1 enzyme, which occurs prior to its attachment to the amino acid cysteine, the active site. Energy in the form of ATP is required in order for the ubiquitin molecule to be transferred to the active site and produce an intermediate substance known as ubiquitin-adenylate. Following this, the ubiquitin-conjugating enzyme (E2) plays its role to bring the two molecules together, by transferring the ubiquitin from E1 to the active cysteine site. The E2 enzyme has a particular structure that allows it to bond to both the ubiquitin and E1 molecules and allow this step to occur. Finally, the ubiquitin protein ligase (E3) is required to recognise and bind the target substrate, subsequently labeling it with the small ubiquitin molecule. This usually occurs by way of an isopeptide bond connecting the last amino acid, glycine 76, of the ubiquitin molecule to a lysine on the substrate protein. This enzymatic process is then repeated to form a small chain with several ubiquitin molecules, marking the protein for degradation in the proteasome.